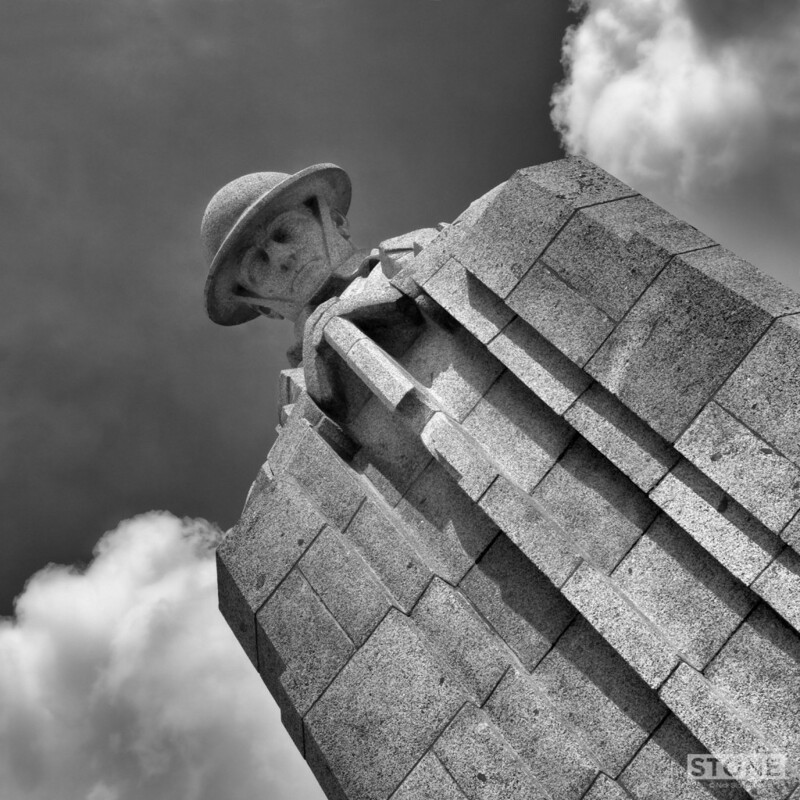 The Brooding soldier; Sint Juliaan or St Julian or Vancouver Corner, take your pick, Flemish, English or Canadian. It sits just to the North East of Ypres on the way to Langemark/Poellcappelle and not far from Passchendaele It is primarily a Canadian memorial. I can remember being quite surprised the first time I came across it on a rainy miserable day in the 1990s, you expect these things to be somewhere that’s special, it isn’t. It’s set back off a small staggered crossroads just the other side of Sint Juliaan next to a small car park surrounded by conifers a bar advertising Jupiler across the road, Tractors and trailers trundle past. Through the trees a tall finger of white extends upwards turning into the head and shoulders of a soldier with reversed arms a symbol of sadness almost lost in the arable land and the maze of small roads that crisscross the landscape. Struggles don’t necessarily account for prime position or landscape, and memorials often mark the ebb and flow on sideroads, up tracks. This one for me is particularly poignant. 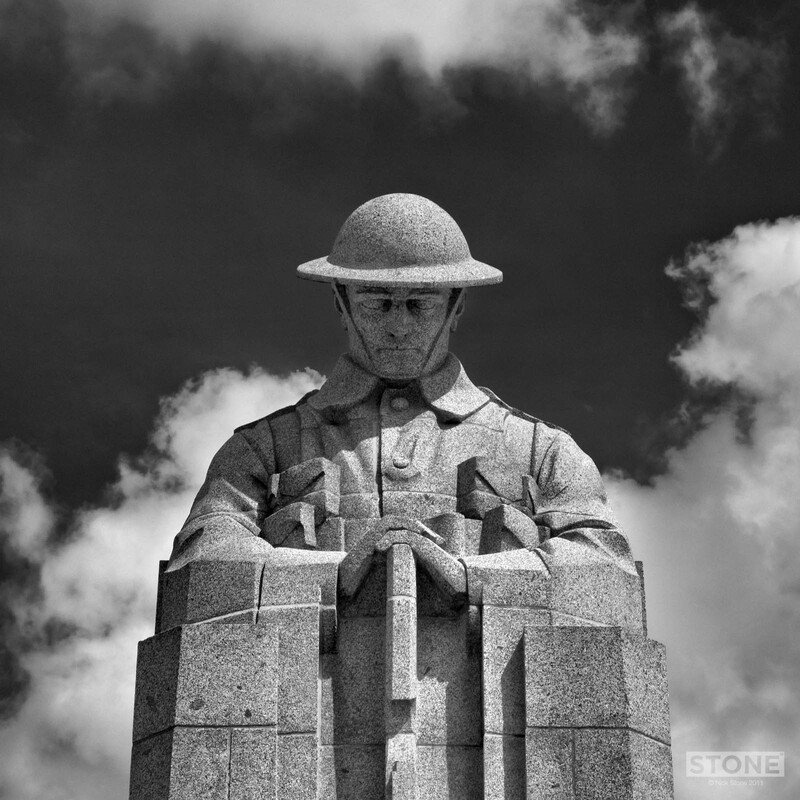 The Memorial was designed by Frederick Chapman Clemesha, this was second in a competition to be memorial on Vimy Ridge, I prefer it. 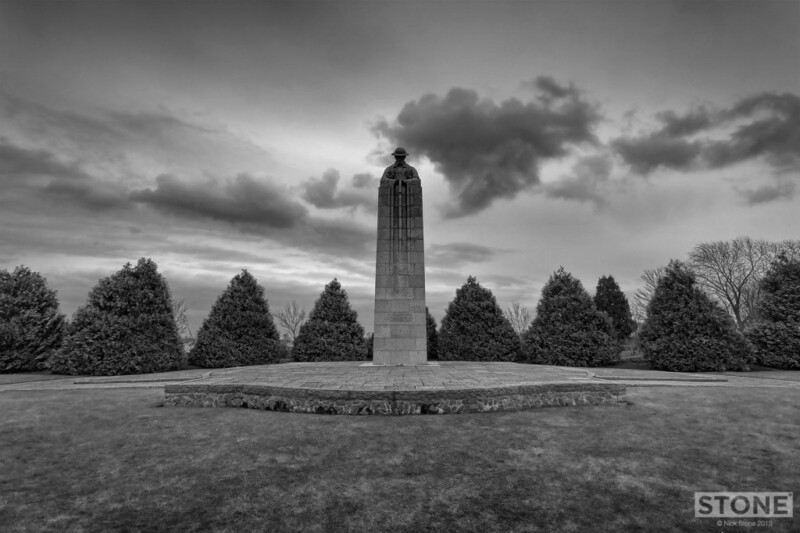 It commemorates part of the Battle of Gravenstafel; The second Battle of Ypres, on the 22nd April 1915 the first poison gas attack using Chlorine on the Western Front took place along this line. 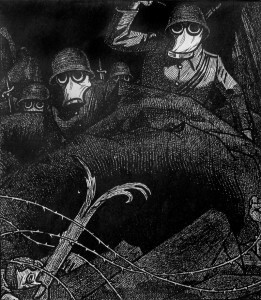 The Germans command ordered the release of 168 tonnes of Chlorine gas. Panic spread as rapidly as the choking cloud did, 6,000 French, Algerian and Moroccan Colonial troops died within ten minutes, the remainder rose from the gas filled trenches; the chlorine being heavier than air had sunk to fill the hollows where the men hid, they were mown down by heavy machine gun fire, the remainder fled, many were blinded or suffering from dreadful lung damage, Chlorine turns to acid on contact with water and oxygen, it literally burns out the soft tissue, men drown on it. The Germans were not too keen to advance into this special poisonous piece of hell and didn’t have the reserves to fill the hole, they’d not expected this level of “success” and didn’t exploit it quickly enough. British and Canadian troops put up a hasty defence and plugged the gap. The gas bleached what remaining grass and leaves there were, along with the uniforms of the dead and wounded. The only gas protection at the time was to piss on a rag and tie it across your face, this didn’t really work but was better than nothing at all. Over the next 3 weeks 6,000 British and Canadian men were wounded or killed in this area. 2,000 are buried on this spot at the St Juliaan Crossroads. Fred Northrop was My Grandmother Jesse’s favourite brother, Our Great Uncle, according to my older brothers a quiet and nice man, they remember him visiting Nan with another relative Frank who was ‘a bit slow’ according to my mum. Fred used to look after him, he had some kind of head injury, Fred himself was a long term asthma sufferer. Like most of my family, he was good solid working class stock, The Northrop clan have lived in Cambridge since 1500, never really advancing much beyond labourers and railwaymen until the 20th century, living in the terraces and cottages in the middle of Cambridge or in the back-to-backs on Hills Road. Fred washed Sausage skins for a living. On the 7th August 1914, aged 23 Private 2173 Frederick George Northrop signed up for the 1/1 Cambs, He embarked to France on 14th February 1915. He lasted 4 months. The 1/1 Cambs became part of the 82nd Brigade of the 27th Division. They landed in France on December 1914 and the 1/1 Cambs became part of a draft to bolster the division as it began its war in France and Flanders landing at Le Havre on the 15th February 1915. His date tallies with the battalion landing. Fred would have seen action at the Battle of Mont St Eloi in March 1915 and the 1/1 Cambs had a terrible time of it at 2nd Ypres and were in Sanctuary Wood when it started. On the 7th May the battalion lost 1 officer and 31 other ranks wounded in artillery bombardments and on the 8th May the Germans attacked the area held by the 27th and 28th Divisions. They specifically centred on the 28th Division initially, but on the 9th May they hit the 27th Division. Their main attack was around Hooge and the shelling continued with gas also being used. ‘Situation still pretty critical-shell fire very heavy officers patrol again out and about put out Plus crossing the Menin Road to deal with any small parties of the enemy.’ – From the 1/1 Cambs war diary for the 9th May 1915. From page 24 of The Cambridgeshires 1914 to 1919 by Brigadier General E Riddell. The 1/1 Cambs continued to move between being in the reserve around Ypres and in the front and support lines between Hooge and Sanctuary Wood. The Germans continued to press home attacks and on the 24th May the 1/1 Cambs had to standby with the rest of their brigade when on the 24th of May the Germans released a gas attack on a 4.5 mile front which forced the British back to a point where the Salient was only three miles in depth. He was discharged from the army through sickness on 11th June 1915. He had been gassed. We can’t tell how it affected him, how long his recovery was, but he never went back to the front. This research has in turn jogged both my much older brothers’ memory, they remembered my Nan Jesse telling them as a child that Fred was gassed in the Great War. Fred who was quiet and kind and had a slight stoop as if his chest troubled him. 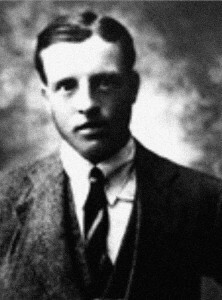 He died in 1976 when I was about 10, that age where although I knew about my lost Grandfather and had an interest in the Great War it extended little beyond a list of places and some medals and a Dead Man’s Penny in a sweet tin, throwing mud-clod grenades at each other from drainage ditches and footings on a building site; ‘The Somme’; that became the Lynfield Estate in North Walsham. Sadly I never met him, as with most families these days it’s easy to slip away, people move, lose touch. His sister; Jesse and Alf Ireton her second husband, another wounded ex-soldier and forester from Hitchin both died before I was born so there really is nobody I know to ask. So Sint Juliaan, although I didn’t realise it on that rainy day in 1998 when the shaft first hove in to view through the gloom, it means so much more than I thought, because although it will always stand to represent the men that died in the field over those days, it also for me represents someone that survived to wade out of the green sea have a family and live a full life and somewhere in my extended family they have his payment, his medals in a drawer. Etching : Otto Dix, In Flanders Fields Museum. Loving your web site and photos’ We have some common interests. My Grandfather was a Volunteer who joined the 1/1 Cambridgeshire Regiment in August 1914. He too left for France on February 14th 1915 and it was also his first action at St Eloi on Sunday March 14th 1915. I have some photo’s from that time and also some of his writings which may be of interest to you. I have a photo of the Regiment taken in Flixecourt I believe in December 1915 when they were attached to the Army Training School. In February/March 1916 my Grandfather was transferred to the 118 MGC . he was eventually injured at Sint Juliaan on 31st July 1917 and was sent back to England where he spent several months at Addenbrooks and was given a Honourable Discharge on 12th March 1918- I have the Certificate and his medals but his Silver Star is missing – lost along the way. If interested please email me and I’d be happy to share with you copies of what I have . Beautiful and moving words and photographs. In Kilkenny, Ireland last night we commemorated a VC winner, CSM Frederic William Hall. It was the centenary of his being killed while rescuing wounded men. He go 2 back safely and the third attempt done for him. English parents, dad in the army, born here in Kilkenny, ought with the Canadians, died at Second Ypres, very near this memorial. Typical Irish soldier in that way. He’s up there on the Menin Gate. Last night the Canadian Ambassador and Defence Attaché came to the ceremony in Kilkenny to pay tribute to him and men like him: My grandad was up the road with the 2nd Worcesters. We got him back though. He’d only lost his religion. Keep up the good work Nick. It’s appreciated.